If you don’t have an email list right now, you’re making a HUGE mistake for yourself and your business. 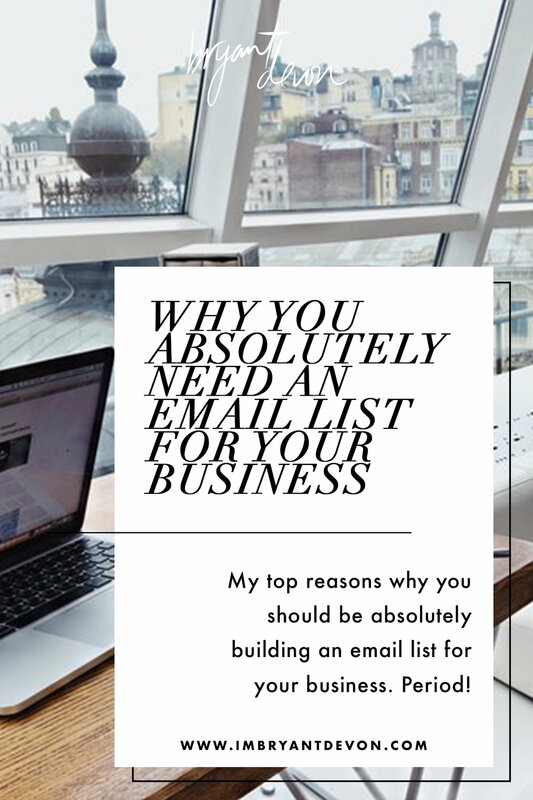 An email list is vital for the success of your business and I’m here to share a few reasons why… these reasons are literally so straight forward that this entire blog post will only take you about 3-4 minutes to read! Let’s get started. If you’re looking to get some news out about your business, an event you’re having or a new product you’re launching… your email list should be your one-stop shop. These people are already interested in what you have to offer and they trust you. Think about it, sure you could launch a Facebook Ad but without the right strategy it won’t be effective and it can be costly… again without the right strategy. You could post it on Instagram but let’s be honest… the chances of it reaching a ton of people there are slim-to-none with the new algorithm updates. Using your email list to reach out to your current subscribers, updating them with information about what you’re offering AND offering them an incentive to share your information with their friends won’t cost you one red cent… and it’s fast! If you have a business and don’t have an email list already… you’re doing it 100% wrong and here’s @imbryantdevon’s top reasons why! 02. Your list is more engaged… period! You will reach more people on your email list than you will on social media… and that’s just the Stone Cold Steve Austin facts. Studies show that the open rate for an email is around 25-30%. On Facebook and Instagram, the average engagement rate is much much lower than 10%. So emails are definitely reaching more of your audience than single social media posts. I’m definitely not saying, “don’t post on social media”, I’m simply letting you know that putting all of your eggs in that social media basket isn’t as beneficial as opting to add in email marketing. There’s a huge difference between someone walking into a room and just saying “Hey guys!” than it is for them to walk into the room and saying “Hey Bryant!” It’s just more personal. The same thing goes when it comes to email. It’s just something so much more personal about an email landing into your inbox that addresses you by your first name than just seeing a generic Facebook or Instagram Ad down your news feed…. and I can bet you one thing, you’re more likely to engage/act from a more personal interaction. 04. You can automate it all, baby! The great thing about email is that it can go on autopilot after you’ve set up your email sequence. This means once someone subscribes to your list, you don’t have to worry about logging into your email client and sending emails out every week, it does all the work for you. This saves you so much time AND stress. If you have built an email list of engaged subscribers, it literally takes a few strokes of your keyboard to send out ideas about your business, requests for testimonials or future product offerings, or conversation. That way, you know what to create, what to improve, and how to move forward in your business without wasting time trying things out that may not work. These are my top reasons to start building an email list! If you’re not investing your energy into creating a email list, you’re missing out on engagement and support from your audience like no other! Do yourself the favor and GET STARTED NOW!